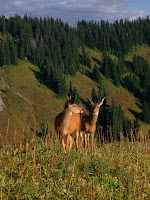 I hiked Mount Rainier in Washington State (United States of America) on 05 September 2005 in company of Jennifer to relax, breathe, and discover wide natural spaces. On our way, we enjoyed a great scenery at Alder Lake then lunched in a train wagon turned into a restaurant. The hike at Mount Rainier in the Paradise area was refreshing, and we appreciated the company of deers apparently used to respect from humans, which is predictable since wandering beyond the tracks is forbidden.